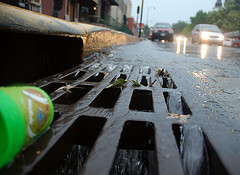 Does Your Stormwater Project Deserve Recognition? If you implemented a storm rainwater initiative in the Bucks, Chester, Delaware, Montgomery, or Philadelphia counties in the past few years, you may be eligible to submit your concept to the Stormwater Best Management Practices (BMPs) Recognition Program. In addition to earning public recognition, winners will each receive an award certificate and have the opportunity to present their projects at the Municipal Project or 2013 PA Stormwater Management Symposium at Villanova University on October 16, 2013. All submissions must meet at least two of seven criteria: water quality improvement, stormwater runoff reduction, erosion reduction, velocity reduction, ecological restoration, use of native species, and monitoring, inspection or maintenance protocol. The Temple-Villanova Sustainable Stormwater Initiative(T-VSSI), a partnership between Temple’s Center for Sustainable Communities and the Villanova Urban Stormwater Partnership, is hosting the competition. To apply, submit a description of your project before September 1, 2013. For more information, visit yellowstone.temple.edu/t-vssi.